This well known chapel and almshouses were founded by Canon John Stevens DD, (Doctor of Physick), in 1457, to house thirteen poor men. 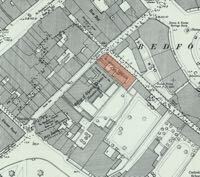 A surviving petition states that Stevens had bought ...a parcel of ground, void at the time of purchase and not built upon, adjoining to the closure of (the) cathedral church. The almshouses and chapel were constructed in the following year. Canon Stevens went on to endow the almshouses the annuity of 17s 4d – this donation was confirmed by a decree of Chancery on 6 July 1633, when it was increased, by an unknown sum, by the Chapter. In 1562, the Rector of St Petrock's, the Rev William Herne, left in his will 13d weekly to each inmate. On the 6 June 1663, this stipend was increased again by Dean Edward Young DD, in his will, with the sum of 40s for the poor of St Catherine's Almshouses, among many other bequests. Robert Hall DD, Treasurer of the Cathedral left in his will, dated 25 April 1667, £10 per annum, to be paid in quarterly portions. Regulations during the 17th and 18th Century changed, allowing married couples to live there. In the 19th Century, they changed again to favour widows, and single women. 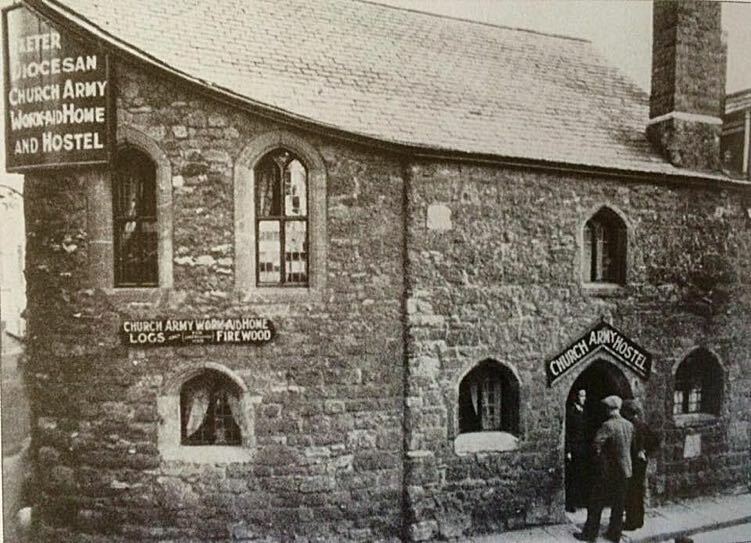 The chapel attached to the almshouses were, by the beginning of the 19th Century, used as a carpenters shop. In 1811, the thirteen residents were increased to fifteen, by installing two extra habitations. By 1879, the poor women in the almshouse each received 3s a week. "S. Catherine's Alms-house, founded in 1495 by the Revd. John Stevens, D.D.. Canon of Exeter. Restored and transferred to the trustees of the Church Army by the Hon. Lady Hotham. 1894." During the second war, servicemen were billeted in the buildings. The bombing of May 1942 destroyed the Almshouses and Chapel. An eleven year old James Bell sheds some light on how the almshouses were destroyed during the blitz. "I remember going into the Chapel, in Catherine Street at 12 noon on the 5th May 1942, walking around and sitting in the pews, There was no sign of the fire which eventually destroyed it–the building next to it was on fire. I was only ten years old! It always raises a wry smile when I read the inscription in the ruins of the St Catherine's Chapel - 'Destroyed by Enemy Action - May 1942'." The National Fire Service were stretched, after the raid, and they were concentrating on burning buildings in other parts of the city. The ruins were sold in April 1959 and in 1961 they were transformed into a memorial to the destruction wrought on the city during the blitz. 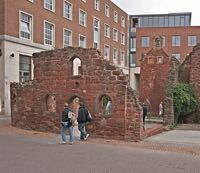 The redevelopment of Princesshay has seen the area behind the ruins opened out and rear access created. 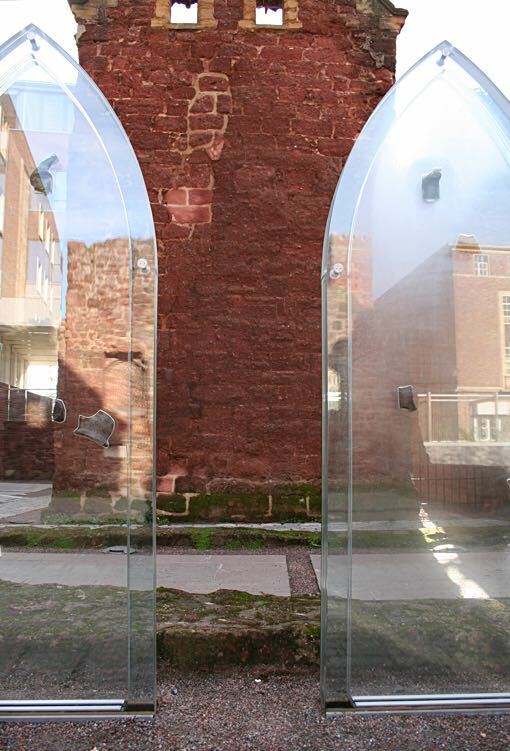 An artwork called Marking Time was installed in 2008, with a series of glass panels that reflect the archeology of the site. The site of the chapel and almshouses had once been transversed by the defensive ditch of the first century legionary fortress and timber remains of an interval tower found. Later, a Roman town house of three or four rooms was constructed on the site, of which part of the mosaic floor was found, and excavated–it was moved to RAMM (museum). 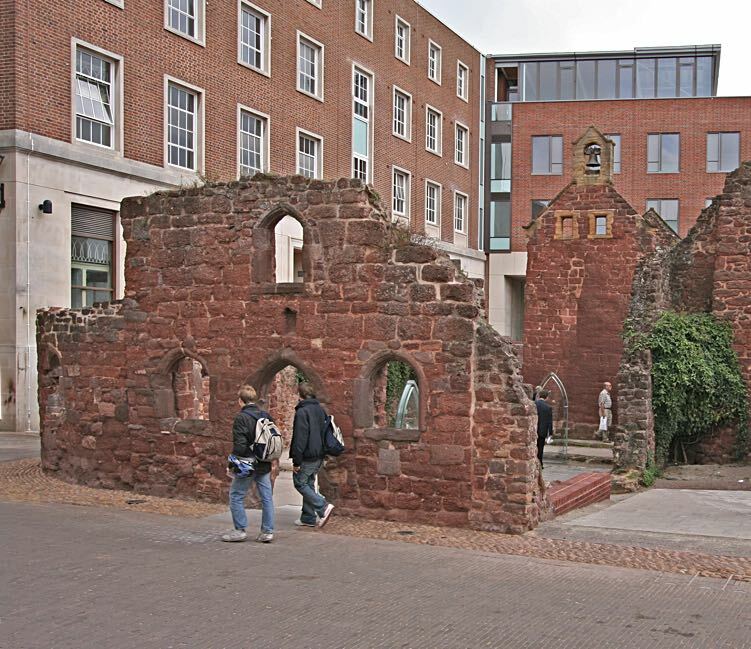 The almshouse and chapel were constructed on open ground, out of red Heavitree breccia with dressing of ashlar or Beer stone, for mouldings around the doors and windows. The southern side was the fortified wall that the Chapter had built to surround Cathedral Close, after the murder of Walter Lechlade in 1283. 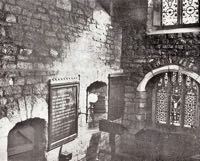 It is believed the chapel was at one time divided horizontally into two floors, with access to the upper, by an internal staircase. Jenkin's states there was also a stone crypt, although there was no trace found in 1894. Outside the entrance door there was the relic of the holy water stoup. The entrance, into the almshouses, was from Catherine Street into a large room that contained a fireplace and bake-oven, in the wall bounding Egypt Lane. The building had a range of small cubicles which opened into a central courtyard. There was a well in the north wall of the courtyard. The wall facing the Cathedral butted up against the Country House Inn. 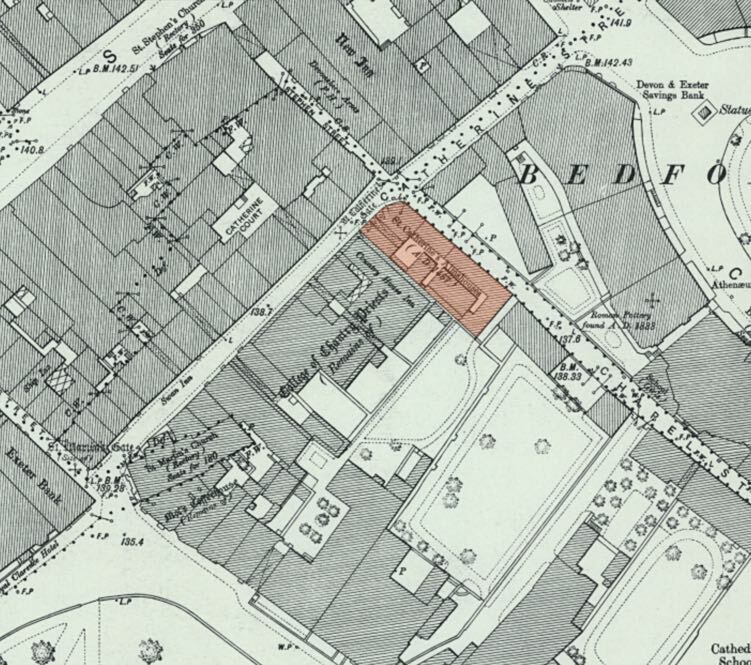 Catherine Gate was on the south side of the almshouses in Catherine Street, adjacent canonry, which became the Country House Inn. The gate was originally known as Erceneske or Bickleigh-gate. The glass panels are an artwork entitled Marking Time. The door shaped panels have pieces of medieval pottery, and glass through to a Coke can that have been excavated by archaeologists during the building work, sandwiched between the panes. Apparently, the type of ring pull on a Coke can will help future archaeologists to date 20th-century artifacts with some precision. "Saturday the Seventeenth Day of May 1777. They gave the Room in St Catherine's Alms House vacated by the Removal of The Widow Williams to the Workhouse to Martha Townsend Spinster." They ordered the Door of Priscilla Rice's Room in St Catherine's Alms House, to be repaired." They ordered Philip Baker's Bill of ten shillings for sweeping chimnies at St Catherine's and St Ann's to be paid." They ordered That the Hatch belonging to the Dog Whipper's Room in St Catherines Alms House, be repaired." They gave to Mary Grant One Shilling & to Eighteen Poor People a Two Penny Loaf Each." They ordered the chapter clerk to give notice (to) Mrs Holmes to quit the house, and when she has quitted they ordered the surveyor to pull down the house and to lay the scite of it into the street"
Sources: Excavations in the War-damaged areas 1945-1947 By Aileen Fox, Western Times, Oliver's 'History of the City of Exeter' and Jenkins 'History of the City of Exeter, and its Environs'. 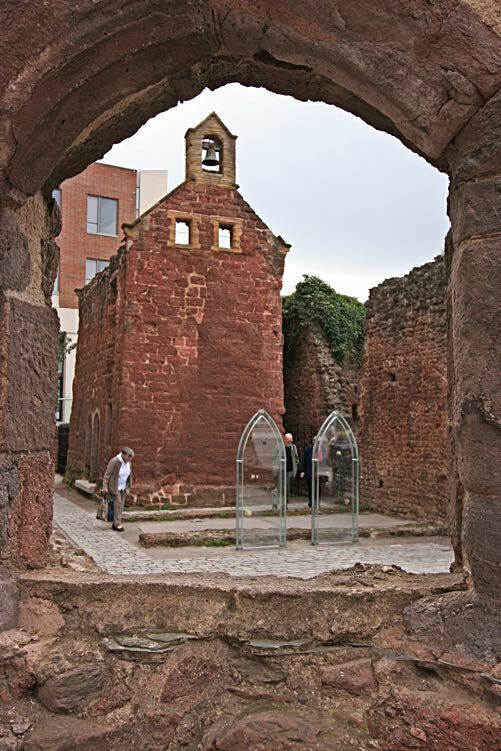 The chapel amongst the ruins of the almshouses. A view of the ruins before the installation of the Marking Time artwork. 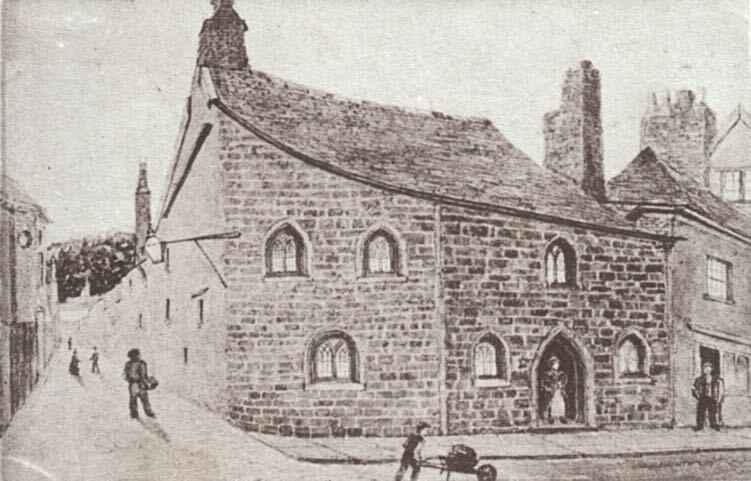 St Catherines Almshouses in the 19th Century. The Chapel is hidden behind the wall, and Egypt Lane is on the left. The Country House Inn is the partial building on the right. 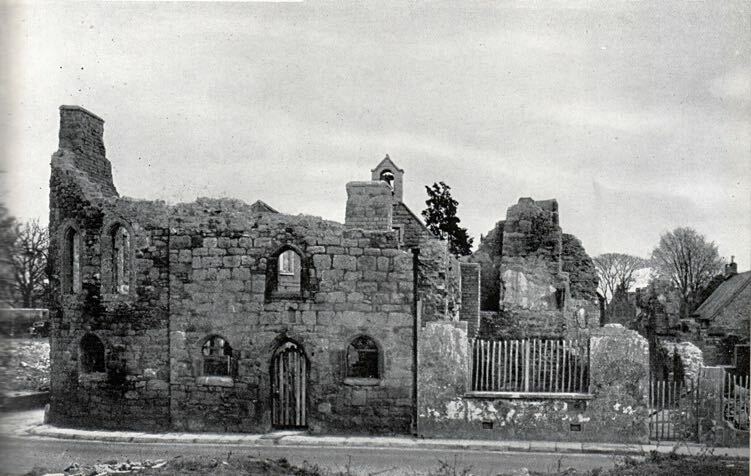 The almshouses after it was taken over by the Church Army. The bombed ruins after 1942. 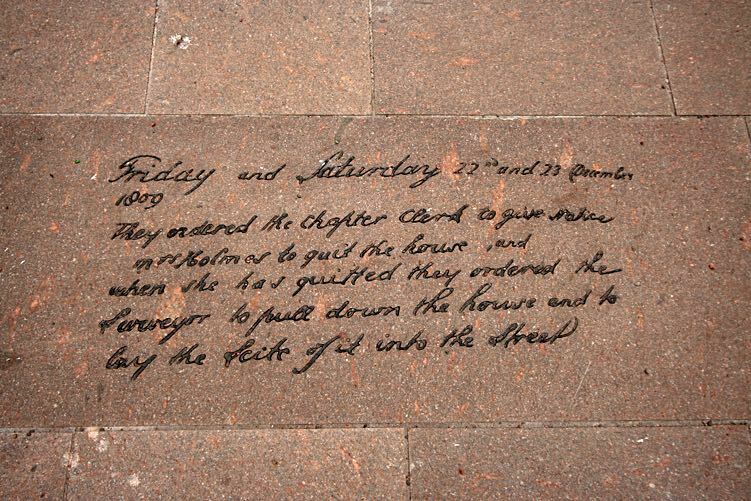 One of the flagstones with a quote from the almshouse records. Two glass panels from the Marking Time artwork. They rerest two doorways in the complex.